For many, turmeric is just a forgotten jar at the back of your spice rack. It occasionally makes an appearance in curries more often than not just to provide a small role. However, this undervalued spice has a long and varied history that hints at some hidden properties. In fact, turmeric may soon be taken from the spice rack and be placed front and centre with the top of the range of health supplements. Several studies have found that turmeric is a source of major health benefits for your body. If early indications prove correct you will soon be blending it up in smoothies and frothing it up in your golden lattes. Here is why you should make this game changer a key part of your health routine. Turmeric comes from the root of the plant Curcuma longa and is often used as a key ingredient in curries. It contains a number of useful plant compounds the most beneficial of which is curcumin. When used as a whole, turmeric has been found to have anti-oxidant, anti-inflammatory and antimicrobial properties. Curcumin makes up 3% of the total weight of turmeric and has many useful properties of its own including being anti-inflammatory, anti-oxidant and even anti-tumour. Many studies focus on curcumin’s use in isolation. While Curcumin occasionally can be more effective used on its own the greater benefits are seen when all the components of turmeric work together as a whole. For at least 4500 years turmeric has been used in medicine, religious ceremonies, and cooking. It was used by the Vedic culture in India to flavour dishes over three millennia ago. There are also records of it being used to guard against evil spirits and even to dye the clothes of Buddhist monks. It soon began to spread throughout the world and by 1200AD it had reached China and Africa. The next mention of its culinary use came in 1747 when its use in an Indian Pickle was published by Hannah Glasse in her cookbook The Art of Cookery Made Plain and Easy. More recently people became aware of the possible benefits of turmeric when a 2006 study discovered that elderly Singaporeans had less cognitive decline if they ate more curry. 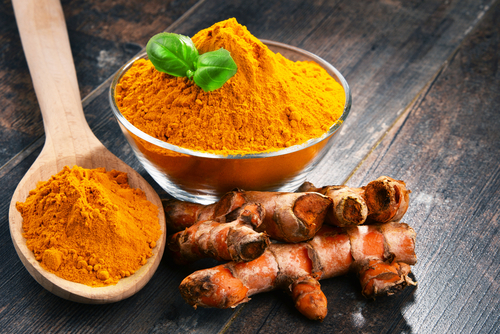 Anti-inflammatory– Professor Garg of Newcastle University discovered that the curcumin in turmeric is a very powerful anti-inflammatory agent. The reduction of inflammation in the body could significantly reduce the risk of arthritis, Alzheimer’s and heart disease. Lower Cholesterol– When curcumin was combined with phytosterol, another component of turmeric, it was found to reduce cholesterol levels. The combined power of these two active ingredients gave better results when used together than when studied individually. Improved cognition – Curcumin supplements also improved the working memory of over 60s in Professor Scholey’s study. He concluded that they significantly improved blood flow to the brain preventing further damage. Prevent Cancer– Studies have also indicated that curcumin may play a role in preventing cancer. It has been seen to prevent some cancerous development and tumor growth in animals. Fights Depression– One study showed that when used to combat depression curcumin was comparable to Prozac. Turmeric boosts a range of hormones useful to boost mood including serotonin and dopamine. The amount from each treatment of any supplement that can actually be used by your body is described as bioavailability. Turmeric has many benefits but only a very small amount of each dose actually becomes available for use. In order to increase this amount there are several methods that can be used. Black Pepper– Piperine is a component of black pepper and when taken with turmeric it can increase bioavailability by 2000%. When curcumin enters the body the liver starts to try and break it down and remove it. Piperine effectively stops this process resulting in better results from the turmeric. Fermentation– When the fermentation process is applied to turmeric it results in a number of actions that increase the active ingredients and makes the components easier to digest. It can increase the content of curcumin by 11% and also makes it more water soluble. Both these methods can make a dose of turmeric much more effective but it is also important to be aware of how the turmeric has been produced. Using organic turmeric will reduce the risk of other chemicals being included in the dose and it will give you the full spectrum of benefits from the root. Effective supplements such as Turmeric root should never be taken in isolation. To get the best results use it as part of a healthy diet, exercise, and relaxation. The great thing about turmeric is that it can make a tasty and colourful addition to many other healthy options. With so many possibilities it is easy to get the most from its flavour and make it a lifestyle rather than just a supplement. When adding turmeric to your meals the amount shown to be effective in studies is between 80 to 200mg. To get the most from it choose an organic source specially prepared for supplementation and take with every meal. With such potential benefits why not try turmeric today?